The Peruvian north coast has excellent conditions for water sports, especially those that depend on the perfect waves and wind. Surfing in Mancora is almost a religion: from small local children to seniors from Lima, living here in front of the warm beaches of northern Peru. 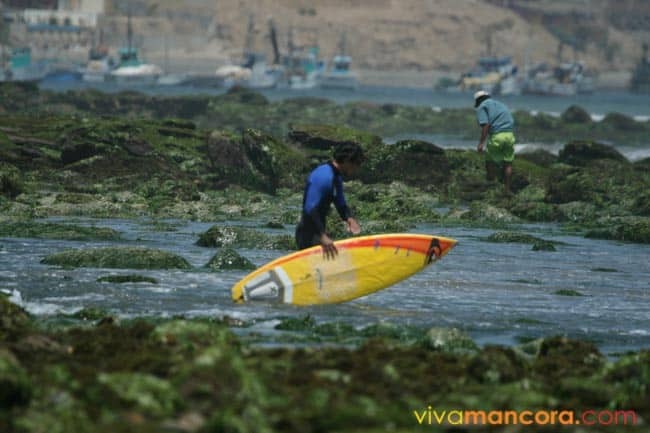 Most of the more than 20 different points on the beaches of Piura and Tumbes are lefts hand, the most perfect when wind conditions and swell direction are ideal. The north of Peru has extraordinary aquatic conditions, whether you’re looking for perfect waves or reliable wind. 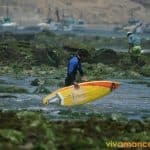 Surfing in Mancora (photo) is like a religion that is practiced by everyone, from local kids to older people from Lima who live on these warm Peruvian shores. As far as kitesurfing, the beaches of Mancora are practically virgin to the sport. The combination of perfect waves and strong winds makes this an ideal place for this new discipline. The “windy” seasons are from April to December, the most constant wind are on August, September and October. At beaches like Lobitos the wind season is more intense, almost all year you can practice kitesurfing, except some days or weeks on January and February. Safari Olas and Ecologic Tours. 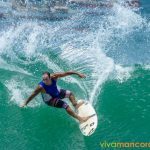 Ricardo Obradovich CEL: +51 977155616 Safari Olas provee SSafari Olas provide surf and kitesurf trips near Mancora like: Lobitos Cabo Blanco Panic Point Peña Redonda Los Organos Also some secret spots!. 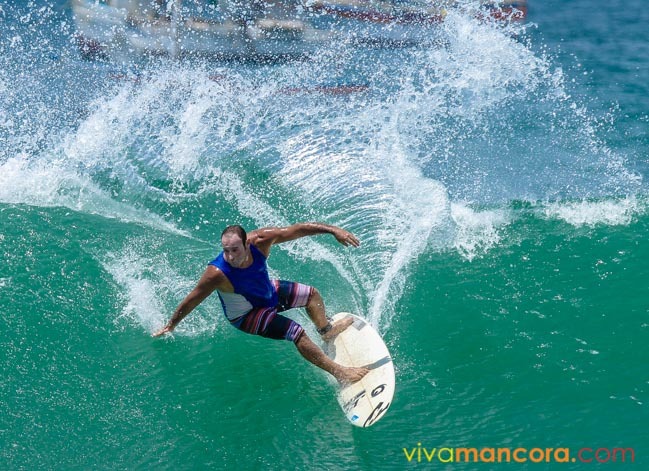 Ricardo has mobility and is on the lookout for the best waves for his clients to enjoy surfing, kitesurfing. Also direct airport transfers to hotels and beach houses, as well as tourist rides like Turtles in the Ñuro, Manglares of Tumbes, among others. Both summer swells (north and northwest, see photo) and winter swells (south and southwest) allow specific surf beaches break differently; so almost all year round there are waves at Mancora and nearby beaches. It is for this reason that is difficult to recommend which surfing season is the best time to surf during the year. 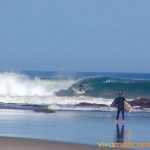 Some beaches, like Lobitos, works best with south swells (S, better SW and SSW) from April to November and on the other hand, in summer (November to March) Los Organos and beaches such as Cabo Blanco are exceptional. Mancora receives both summer and winter swells (expect swells too little and south, like S and SSW), resulting in a long left wave (reef break), very consistent, with several sections during the wave. The tourism and quality / consistent of the wave have made Mancora a semi crowd wave on this days: there are usually an average of 25 people in the water, many apprentices, some more experimented surfers and a strong dose of local surfers. The waves in the area never exceed 3 meters and in general the surfers come to this stretch of coastline looking for perfection more that big waves. 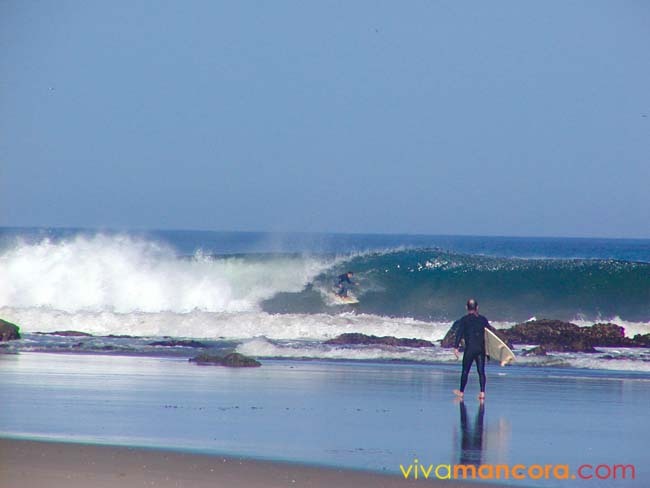 Cabo Blanco (35 kms south of Mancora) is considered the most perfect wave all over Peru. 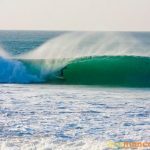 The crowd and poor consistent of this beach (breaks no more than 8 times a year) make it sometimes tedious to surf, but being inside in a good barrel at Cabo Blanco is a dream come true: tubular and perfect from beginning to end. Mancora is usually between 1 and 2 mts. high. Waves as Panic Point and El Hueco (Lobitos) are the most aggressive and can reach up to 3 mts in size, perfect waves, long and tubular. 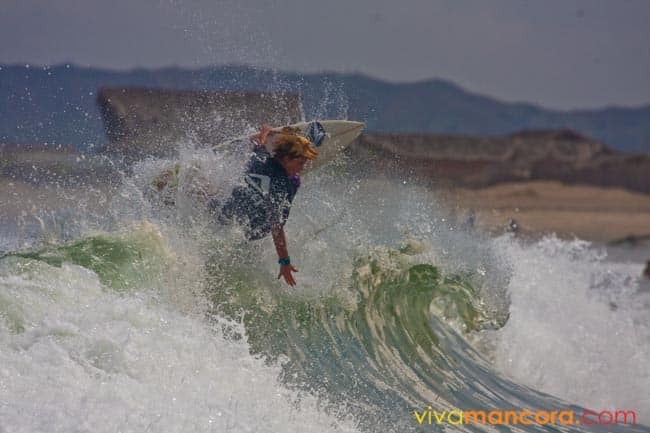 Due to its geographic location, the provinces of Piura and Tumbes receive excellent swells from the north (October-April), south (April- September), southeast and northeast. South of Cabo Blanco (see map) two currents crash, the Humboldt from the south and the Equatorial from the north, producing remarkable differences in water temperatures between beaches only a few kilometers apart. 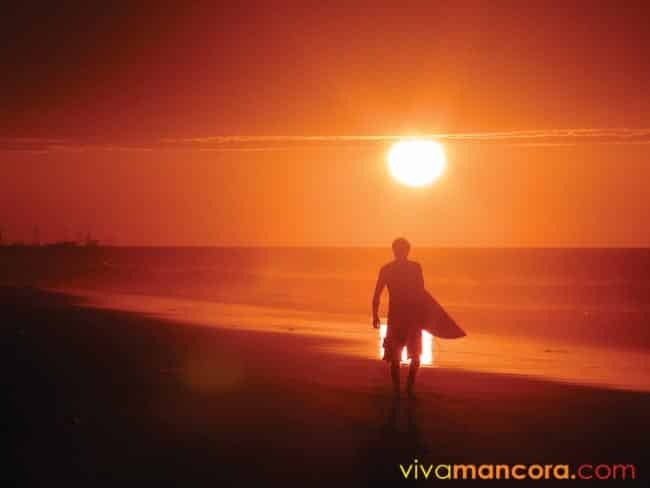 For example, you can surf in Mancora in board shorts and then surf the same morning in Lobitos (70 kms south) and the temperature drops to the point where a 3/2 full suit is required. Of you only are going to surf at Mancora, we do not recommend any extra wetsuit, maybe a short one on exceptional weeks. If you are going to Lobitos, we strongly recommend you a thin long wetsuit (3-2mm) almost all year, except summer time. – Secrets point not included, contact local guides. N: North / NO: Norwest/ O: West (summer swells: between October and April). S: South / SSO: South southwest / SO: southwest. (winter swells: between March and November). Location: Km 1240 of the Panamerican Highway (500 mts north from Zorritos). Details: Santa Rosa is a really good wave that break only few times a year. Uncrowded does not like wind. Occasionally tubes. Classic size: 2 mts. If the ocean is really big at Mancora on summer, Santa Rosa probably is really good and only few people surfing it. Swells: Big north swells, direction N / NO / O. Location: Km 1212 of the Panamerican Highway (close to Pta Mero). The wave: Beach break with short lefts and rights, Occasionally tubes. Details: It can be tricky to catch this place with good conditions. It is ideal to arrive very early before the wind picks up. When there are no waves at any other break you will find a little ride able wave here. If the ocean is big at Mancora, Peña Redonda probably won’t work. Swells: Soft N / NO and O swells . Also soft S / SO and SSO swells. Location: Km 1165 of the Panamerican Highway (in front of Las Olas and The Pink Parrot accommodations). Getting here: From Mancora, just walk through the beach or take a moto taxi. The wave: Left reef break, long and funny.. Details: Rarely barrels (on El Ñiño conditions, a lot of tubes). 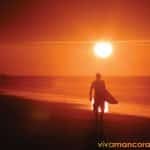 Is a good surfing beach, sometimes really fast and usually crowded (20 to 30 surfers at the beach), Perfect for beginners (is one of the best waves for learning in all south america), mostly on the second or third section of the wave. On the afternoons winds usually show up, sometimes really good for kitesurf. Maximum wave size of 2 1/2 mts. Bigger, the wave just does not break good, except with El Ñiño conditions. Is a consistent beach, almost all year long breaks..
Kitesurf: For kite is a good beach, mostly from April to December, with winds up to 30 knobs. Swells: All swells, expect S and SSW little swells. Location: At Los Organos, Km 1153 of the Panamerican Highway (13 kms south from Máncora). Details: Both good waves for beginners. Lefts, not so fast and no too dangerous.. When north swells are big, Casablanca break good, long and fast. Swells: North swells for Casablanca, south swells for El Codito. Getting here: From mancora are buses and taxis that go to Los Organos. Then walk, taxi or moto taxi to the points (Punta Veleros area). The wave: Left reef break powerfull and sometimes tubular. Details: One of the best waves in Peru. It holds up to two and a half meters (8ft.) with various tube sections. It is definitely a memorable wave when the conditions are correct. Swells: N , NO and O.
Kitesurf: Even there is wind, we don’t see to many kitesurfers on the area. Location: Alt Km 1137 of the Panamerican Highway (4 kms from El Alto, 25 kms from Máncora). Getting here: Direct taxi – private transportation from Mancora. Any transportation to El Alto. Then transportation to Cabo Blanco. The wave: Left reef break, strong, magical and completely tubular. Details: Cabo Blanco is world famous for its long, perfect tubes. In a few words, it’s a perfect wave with heights up to 3 meters (10 ft.). The best wave in all Peru. Usually is crowd and break just few times a year (8), lots of localism. Kitesurf: No report on Cabo Blanco, but just 500 mts south from here is Cabo Blanquillo, a nice kitesurfer wave. Location: Alt. Km 1137 of the Panamerican Highway (4 kms from El Alto, 25 kms from Máncora). The wave: Left reef break, very strong with several barrel sections. Details: Una de las mejores olas del norte, junto a Cabo Blanco y Órganos. Muy larga, con series que pueden llegar a los 4 mts. Kitesurf: No report on Panic Poinr, but just 500 mts south from here is Cabo Blanquillo, a nice kitesurfer wave..
Swells: Big winter south swells, direction S / SO / SSO. Location: Km 1104 of the Panamerican Highway (17 kms from Talara, 65 kms from Máncora). Getting here: Any transportation to Talara (from Mancora take EPPO or “colectivos”), from there, transportation to Lobitos. Direct taxi – private transportation from Mancora. The wave: Lefts, point breaks. Lobitos and El Hueco are world class waves. For kitesurf is also paradise, one of the best beaches in Peru for surf and kitesurf. Swells: The best is with south swells, directions S , SO y SSO.Some points of Lobitos also can break with north swells. La Piscina: Left breaking wave with sand and reef bottom. A fun little wave with tubes that form best in the second section. It is a good option when Lobitos is too small to surf. The beach is located on a military facility. El Muelle: Located aside from the pier of Lobitos, is left is short, quick and barre ling! Lobitos (photo): Long powerful left that regularly forms tubes as it breaks over a bottom of sand and rock. An increasable wave that was discovered only a few years ago. Almost the whole bottom is composed of sand. You will encounter strong winds every afternoon that can either make the wave better or worse. The wind here is strong, especially in the afternoons. Baterías: Located 2 kms south from Lobitos, Baterías is a pretty wave that only sometimes is with good conditions, not as consistent as Lobitos and Piscina. Sometimes with north swells can surprise you. Kitesurf: Many experimented kitesurfers comment that Lobitos is a great wave for waves and kitesurfing. The quality and regularity winds from April to December, with a perfect long left wave, make Lobitos a must for kitesurfers.